Club Deportivo Palestino had a remarkable 97-year history and TİKA has recently partnered with the club to support it. The story dates back to the 1850s. The alliance of the Ottoman, British and French empires fought the Russian Empire for three destructive years. The battle brought nothing but misery to the people across two continents from 1853 to 1856, and it paved the path for a unique minority to flee the bloodshed to Chile, a country some 10,000 kilometers (6214 miles) away. Palestinians, along with many others, had fallen victim to the Crimean War, which was destined to mark the beginning of a new era for centuries to come. In spite of having suffered harsh oppression and all-out alienation in the first decades, World War I and World War II immensely added to the number of Palestinians living in the southern Latin American country. Some 450,000 to 500,000 Palestinians, most of whom are Christians, live in Chile today. Running some of the most lucrative businesses and occupying the jobs of the well-educated, the Palestinian minority calls Chile home. 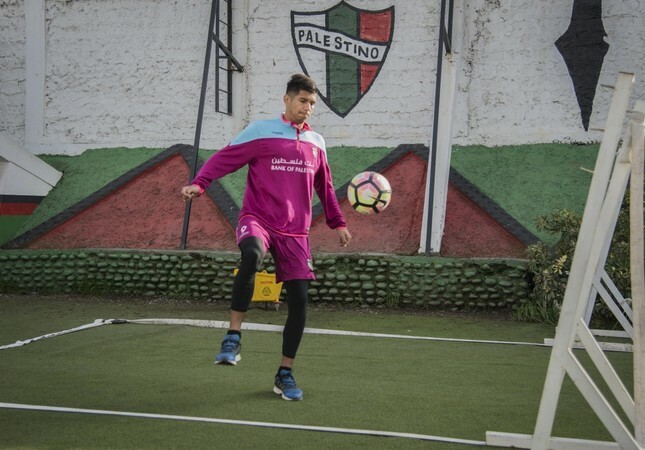 Club Deportivo Palestino is one of the factors that have freed the way for the Palestinian minority to band together with the country. The football club, which was founded in 1920 by Palestinian immigrants, used to be mistakenly called "Los Turcos" (The Turks) for their Ottoman roots. Following in the footsteps of bright Palestinians in the country, the football club has had a remarkable history over the course of the past 97 years. The chairman of Club Deportivo Palestino, Jorge Uauy Salvador, is a third generation Palestinian-Chilean. His grandfather, also an Orthodox Christian Palestinian, sought prosperity and tranquility by moving to Chile, which Salvador asserts to have found. Displaying a gallant demeanor with his well-known Palestinian-style scarf around the neck, also known as keffiyeh, at Club Deportivo Palestino's stadium just outside the city center of the Chilean capital Santiago, Salvador warms the atmosphere on a chilly winter day. "We are like cousins, you know," he chuckles, referring to the bond between Turks and Palestinians. Club Deportivo Palestino has recently embarked on a historically exceptional partnership with the Turkish Cooperation and Coordination Agency (TİKA). The agency is set to provide the "brother" football club with whatever is necessary to some extent. "Turks and Arabs are very close. Our life styles, customs and traditions are all same," Salvador says, adding, "we lack here many. Each and every help we can receive from TİKA is quite valuable to us." The chairman gazes at his players raising dust clouds off the turf with footballs freshly delivered by TİKA as he dreams of playing a friendly match with a Turkish club in Turkey where he would also be physically bonded with his roots. The recent spurt in Turkey's close affiliation with the Palestinian minority in Chile stretches farther than partnership with a football club. Union Arabe de Beneficencia, a charity organization in Santiago, is in the service of needy Arabs. The union struggles to look after the elderly in a crummy compound in suburban Santiago. The roofs are dripping, the walls have long given up the battle against cracks and the elderly are compelled to live shoulder-to-shoulder at a time of their lifetime when they finally need some personal space. Miron Elorriaga is 75. Smoking cigarettes in front of her room is the sole thing that gives her pleasure in addition to watching Turkish TV series all day long. Listening to the chatters of her peers in the common room is one thing she is fed up with. Elorriaga recalls her past as she inhales a big puff of smoke from her cigarette. The 75-year-old Lebanese woman is the second generation in Chile. Her daughter is married to a Palestinian, yet alas, the couple confined her to the retirement home years ago. "I can't bear hearing anything anymore. I'll have another cigarette." The cigarette and Turkish TV series addict has only one wish from God: Better circumstances around her. In a bit to quench the need of the retirement home, TİKA has recently extended a helping hand. Physical rehabilitation equipment are already at the service of the elderly, and the Turkish coordination agency is working on a project to enhance the living conditions in the rooms. "Fantastico," is the only word Elorriaga needs to describe the Turkish help. Lucia Jurre spends the rest of her life just across the street within the little compound. The 77-year-old has not been able to stand on her feet for the past year, and three surgeries did not help her find comfort in the brisk room. Recollecting her ancestors, Jurre says the Lebanese, Palestinian and Turkish were brothers and sisters once, and "we still are." Despite bearing the burden of knowing that the remaining part of her life may be crippled, Jurre's eyes shines upon hearing that extended TİKA help will arrive soon. "We desperately need it. Much appreciated."